Shuster, M. D., "A Survey of Attitude Representations," ''Journal of the Astronautical Sciences,'' Vol. 41, No. 4, Oct.-Dec. 1993, pp. 439-517. 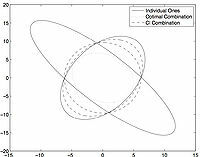 Crassidis, J.L., Cheng, Y., Nebelecky, C.K., and Fosbury, A.M., “[http://ancs.eng.buffalo.edu/pdf/ancs_papers/2009/JAS09_ci_att.pdf Decentralized Attitude Estimation Using a Quaternion Covariance Intersection Approach],” The Journal of the Astronautical Sciences, Vol. 57, Nos. 1 & 2, Jan.–June 2009, pp. 113–128. Nebelecky, C. K., Crassidis, J. L., Fosbury, A. M., and Cheng, Y., “[http://ancs.eng.buffalo.edu/pdf/ancs_papers/2012/jgcd12_ci_mrp.pdf Efficient Covariance Intersection of Attitude Estimation Using a Local-Error Representation]”, ''Journal of Guidance, Control, and Dynamics'' Vol. 35, No. 2, Mar.-Apr. 2012, pp 692 –696. Nebelecky, C.K., Crassidis, J.L., Banas, W.D., Cheng, Y., and Fosbury, A.M., “[http://ancs.eng.buffalo.edu/pdf/ancs_papers/2009/gnc09_att_ci.pdf Decentralized Relative Attitude Estimation for Three-Spacecraft Formation Flying Applications],” AIAA Guidance, Navigation, and Control Conference, Chicago, IL, Aug. 2009, AIAA Paper #2009-6313. Cheng, Y., Banas, W.D., and Crassidis, J.L., “[http://ancs.eng.buffalo.edu/pdf/ancs_papers/2012/barsym.pdf Quaternion Data Fusion],” Itzhack Y. Bar-Itzhack Memorial Symposium on Estimation, Navigation, and Spacecraft Control, Haifa, Israel, Oct. 2012, Paper MoA1 .3.